"The purpose principle – missions give businesses strength"
How do you stay on the right side of the interactive internet? Become a master of social media with these key pointers. Social media has been one of the biggest seismic changes to hit business in the past decade. Businesses could once message their purpose and blithely believe that customers, employees and partners accepted and trusted that the purpose was being met. But today, social media gives everyone the ability and voice to hold businesses accountable for promises made. If you promise that your company will act with integrity, protect people and the environment and dedicate a portion of profits to these efforts, then examples of promises unkept will be captured, shared and amplified. "The more transparent you are, the greater interest the audience will have to follow your journey." This capability strikes fear in the hearts of many businesses, but it doesn't have to. I've spent the past 15 years explaining how to master social media for the benefit of your business and customers. And I believe that now it's even more important than ever to understand how social media creates a virtuous circle in which it acts as the conscience of the company and holds it accountable for doing things wrong while also rewarding it for doing things right. People want to work with businesses that do more than deliver great products and experiences – they want to align themselves with organizations that reflect their personal beliefs and that seek to make the world a better place. There are a number of ways in which you can use social media to develop, live and reinforce your purpose. The first is to ensure that you listen for purpose resonance. By that I mean that if you are in the process of redefining your purpose, social media can be a fantastic way to figure out what resonates with your customers. What topics in your past social posts have gotten the most comments or shares? Or if you have a new purpose statement, how is it being received? Social media is a messy, volatile cauldron of opinions, misquoted facts and hearsay. Filtering out the noise is partly science, mostly art – so social media listening takes practice and time to draw meaning from the data. Listening and defining is a good start, but from there you need to develop a relationship. Purpose isn't a "one-and-done" campaign that you can run for six weeks and then turn off. Too often social media finds its place as part of marketing planning when it is much more than that. It should instead be at the vanguard of creating the relationship your business needs, where you begin a conversation about your corporate social responsibility (CSR) efforts. For example, "green" cleaning products brand Seventh Generation steers people who comment on their social channels to their "Generation Good" community site, where they can provide feedback, submit ideas and even test products under development. Relationships are based on trust, so your message has to be honest. For that reason it's vital that you speak the truth, especially if you are unsure about what is going on. Here's an example: In 2006, one of Dell's notebooks spontaneously burst into flames. When a photo of the laptop started hitting social and mainstream media, Dell wrote a blog post about it – and included a link to the photo. That's right, the company published a photo of one of its products blowing up and shared that while they thought it was a battery issue, they weren't 100% sure. Even today, 12 years later, many companies struggle with telling the truth – or trusting that the relationship is strong enough with customers to simply provide an update. Be honest about your purposes, how well you are doing but also the challenges and setbacks that you are facing. The more transparent you are, the greater interest the audience will have to follow your journey. Charlene Li is a principal analyst and the founder of Altimeter, now a part of Prophet. She is the author of five books, including the "New York Times" bestseller "Open Leadership", and the co-author of the critically acclaimed "Groundswell". Those three small interventions – listening and defining your purpose, developing a relationship and being truthful – can prepare the ground well for your purpose plans. Then you can move on to how you can use social media within the company as a tool to push forward. Empowering employees is a case in point and Southwest Airlines offers a good example that you could emulate. The company's stated purpose is to "connect people to what's important in their lives through friendly, reliable and low-cost air travel" and it has done this brilliantly on social media. This past March, a social care team member named "Mike" was answering a mid-flight tweet from an irate passenger who had paid for Wi-Fi but couldn't livestream a basketball playoff game of her beloved college. Mike explained that they limit livestreaming and then gave a quick update: "You're up at the half." The passenger asked a favor: "Any chance you can live tweet the second half for me?" Mike obliged and turned an unhappy customer into a raving fan – and spawned multiple positive articles. Southwest Airlines also encourages all of its employees to use their own personal social media accounts to share their experiences and passions at the company, trusting that they are aligned in a common purpose through a strong culture of customer service and training. Two final words of advice to help you harness social media for your purpose: "Use it." Post frequently and use visuals. If you are doing good work that exemplifies your purpose, be sure to share it! IBM recently conducted a study that correlated the number of social media mentions needed to raise the prominence of CSR programs based on the company's net income. This makes sense – if you have a larger company, then you need more social media mentions to move the needle. One of the ways to increase mentions is to include photos, videos or even livestreams of events because posts with visual elements boost engagements and sharing. The positive feedback loop created by social media can become addictive – you do good work, share it on social and get rewarded with recognition that acts as positive reinforcement. The social media "flywheel" takes time, effort and resources to get started, but the benefits of more aware and engaged customers and employees will be well worth it. Disclosure: Dell, IBM and Southwest Airlines have been Altimeter clients. How can a successful company embrace purpose? Is the Russian economy ready to boom? What does purpose mean to you and your business? Our Think:Act magazine on purpose addresses changing values in the business world. Curious about the contents of our newest Think:Act magazine? Receive your very own copy by signing up now! 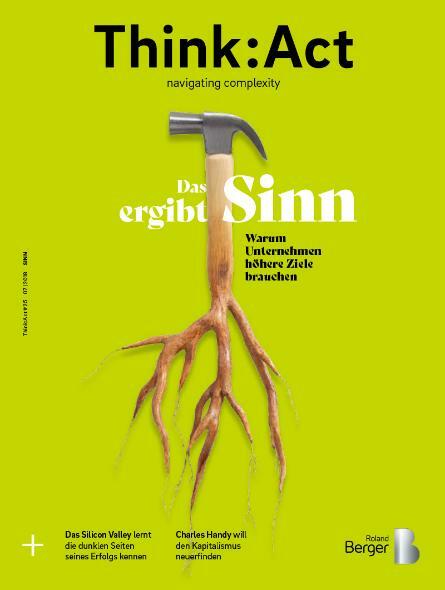 Subscribe here to receive our Think:Act magazine and the latest news from Roland Berger.